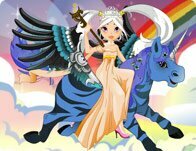 Description: After the rain comes the rainbow and riding the rainbow comes: Skye. Instructions: use your mouse to click on and through the floating clothing, hair, background, accessory and rainbow options of this fun, fantasy rainbow friend. Run to the last train because it's leaving the station! Everyone will remember the trip you've made to get here, and you're going to have an excellent time going across the country in a fun train trip!